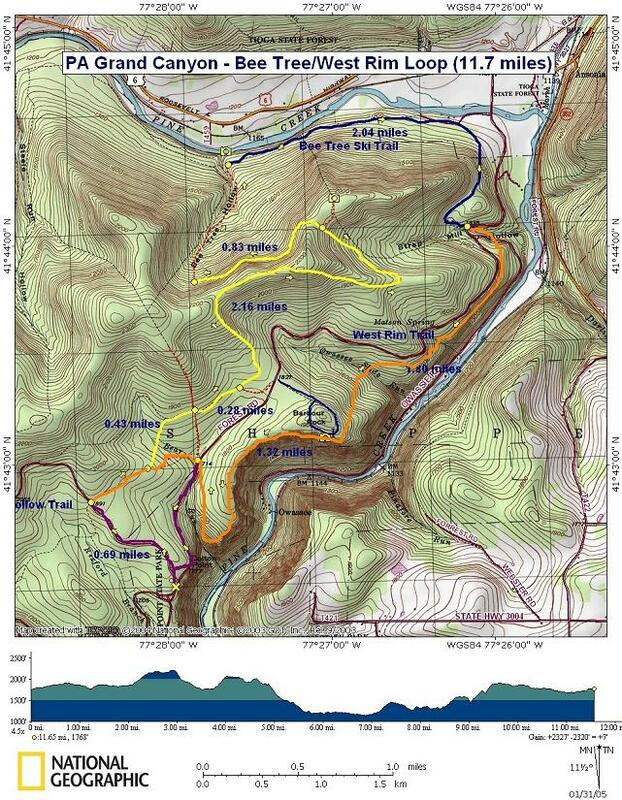 Description: When most hikers hear about the PA Grand Canyon they think of backpacking the 35 mile West Rim Trail. Seldom do they think of all of the possible circuits that might be made using adjacent trails. Chuck Dillon, Owner/operator of Pine Creek Outfitters and author of several outdoors books related to this region provided me with this loop not found in his “Short Hikes in Pennsylvania’s Grand Canyon”. I originally did the loop twice in 1998. Since then I had lost the hand drawn map that Chuck had provided me. As my efforts had become focused on the Monongahela National Forest in WV I thought nothing else about this wonderful area in north-central PA. Two weeks ago, while sifting through shoe boxes of old photos, I came upon several from our ’98 trips. I contacted Chuck and he gladly provided another replicate of his map. He had told me that a lot of logging occurs in the Tioga Forest, obliterating many trails, but that this circuit still remained intact. The map on this page is based on his original. want to catch all of the views you can make the hike about 10 miles by starting where the West Rim Trail crosses Colton Rd north of the park or 8 miles by starting at the Barbour Rocks Overlook parking area. The first few miles is primarily a walk in the woods until you reach the north side of a high ridge. Then there is an easy, open-woods bushwhack down to Pine Creek. From there you’ll pass through hardwood, birch, Pine and Hemlock as you follow the Bee Tree Ski Trail to the upper end of the West Rim Trail. Parts of the West Rim Trail are devoid of any views of the Canyon but then other stretches will blow you away. The hike starts at Colton State Park. uphill. 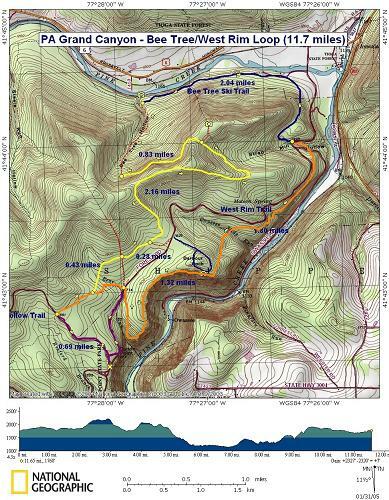 In about 0.7 miles reach the intersection with the orange blazed West Rim Trail. Turn right here. In about 0.3 miles, come to a fork in the trail. The West Rim Trail bears right towards Colton Rd. Bear left here onto an un-named trail. Soon cross Bear Run and pass a nice campsite on the opposite bank. Cross through a wet area (about 50 yards long). The trail may be hard to follow at this point but maintain a north-easterly course until you pick the trail up on the other side. At 0.4 miles from the last trail junction come to a four way intersection. Continue straight. In 0.3 miles from the 4X intersection come to an unmarked spur trail on the right that leads to Barbour Rocks. Continue straight on the main trail. Shortly after this the trail will make a sharp left hand turn. Soon you’ll find yourself walking through a shallow draw of sorts on an old woods road. As you approach the top a footpath scoots up a little, steep hill on the right. Ignore this as it only circles back onto the trail you're on but behind you. Continue up the old road and soon reach the top of the ridge. The trail turns hard right here. Pass areas of recently timbered forest being filled in by dense growths of small trees. All along this segment there is an abundance of black berries along the trail in season. Descend along the spine of the ridge in an easterly direction. Soon the trail will reverse its direction and go due west under the ridge you just traveled. This is a pretty wide, sunny road at this point. At 2.16 miles from the last trail junction, look for a faint footpath on the right. This leads to a wooded knob that looks over Pine Creek and the distant mountains of Tioga Forest. The overgrown trail weaves in and out of thickets before reaching the knob but the view in the shade is worth the hassle. an exact point on the road but is about 0.8 miles from the overlook turn-off previously mentioned. It’s pretty easy finding the slight dip in the road. Assuming you are still heading west on the woods road turn right off of the road and walk down hill in an almost northerly direction. Keep an eye out for signs of a part-time stream, probably on your left since the hill on the other side of the Hollow is a lot steeper than the one your walking down. You may see random yellow sprayings on some trees to the right. Ignore these. As the streambed becomes more defined follow it down to Pine Creek. The bushwhack should be about 0.7 miles long. If water is running in the stream there might be a little waterfall where it empties into Pine Creek. If you’re hiking this in the summer (low water levels in Pine Creek) try to get down on the gravel bar below the stream for some great views and possible wild flower discoveries. This is a great spot for lunch! After taking this all in pick up the obvious blue blazed Bee Tree Ski Trail and follow it East (downstream). Although the trail approximately parallels the creek there are no views of it to be had unless you bushwhack out to it. Note that the banks are steep and rocky for the first 0.5 miles after turning east onto the trail. Follow the Bee Tree Ski Trail through constantly changing hardwood, birch, evergreen and fern plantations. It’s a very pleasant hike but you can tell that man has had a significant impact on this part of the forest. In 2.04 miles from the stream arrive at Colton Road. Cross it and pick up the orange blazed West Rim Trail. From here the trail is easy to follow. Initially you’ll get some views of the canyon before the trail veers away from the rim and crosses through the hollow formed by Owassce Run. In 1.8 miles from crossing Colton Road arrive at Barbour Rock. The views for the next mile or so are outstanding. As you approach Bear Run Hollow the trail will make a hard right turn and follow the edge of the hollow out to Colton Road. In 1.32 miles from leaving Barbour Rock come to Colton Rd. Turn left here and follow the shoulder of the road for about 0.7 miles back to your car. If time and stamina allow try to check out the little loop around the park rim trail for even more views. The Turkey Path will take you down to Pine Creek. comment: This is a good and moderately challenging hike, and probably your best bet for doing a one-day hike of Pine Creek Gorge. The trick here is finding your way; some of the trail is unmarked, so you have to be patient with a little exploration. We made this trip in late April, when it was still drizzly and chilly. There was still plenty of leaf cover on the ground, which became a problem: the unnamed trail that is mentioned in the first paragraph was invisible, completely covered by leaves. We walked over the spot where it was supposed to be several times but saw no sign of it. We walked on along the main trail instead. About a half-mile later we took a left and caught up with the unnamed trail at a clearing. After that, the trail was exactly as advertised. One thing to be careful of; it's very easy to walk right past Barbour Rock and descend to the road, thereby skipping some of the roughest and most interesting part of the hike. Make sure you switch back to the south and ascend the hill behind you instead, because it's worth the walk. Not a scenic vista, but a fun bushwack and a good walk along the creek. We made this walk in about 6 or 7 hours, but it could probably be done a lot faster if you stay on track better than we did. Hope this helps. Enjoy your hike!